Sitting at Judy’s table watching the cream volcano-up in my coffee, I listened as she told me about the good-old-days—days I didn’t live, but days I experienced in Grandma’s kitchen—when I mentally traveled with Judy all along the way, holding hands, skipping together, laughing, and loving like two best buddies in the summer sunshine. Communicating through memoir writing is definitely a different way of connecting with family because it is an internal process. Judy’s teaching has helped me to put into words the stories, thoughts, and feelings I have held inside. A unique and personal activity, for me, writing took a very special, caring teacher to help me discover my words. Helping new friends find their writing voice, Judy Watters’s joyful personality encourages my words to flow effortlessly from my memory. Judy Watters has a pioneer spirit, like her father and mother before her, a pioneer of attempting new and wonderful things. She is a curator of memories. In this new endeavor of nostalgic reflection, Judy has jogged seemingly insignificant memories from me to find the ones that make me unique. She has gently encouraged me to put those real moments into words. Memoir writing from Judy generates inspiration, entertainment, excitement, and energy for those with a story to tell. I love to write, always have. I was a mediocre writer before I joined Judy Watters’ legacy writing group. What a difference her instruction has made in my writing. She gives handouts about do’s and don’ts and how to make my writing come alive. She encourages lots of dialogue to give the writing an active life. Through her practice prompts and her writing tips, I have greatly improved my writing skills and hope to publish a book of my own soon. The Road Home led me back to everything wonderful about my childhood in the Midwest. Coffee hot, reading glasses settled, I sank deep into my cozy chair and relived hilarious family Halloweens —ones with real apples fresh from the orchard, bobbing in real galvanized buckets. I also remembered winter afternoons when icy roads made a simple thing like getting home from school treacherous. Besides her delightful forays into sibling rivalry, Judy’s stories memorialize her Jewish city dad’s devotion to his country bride. Tears of “sheer” delight and homegrown humor take us down Sheer Road. You’ll likely enjoy the shade under the trees along the way. Just like I did. Memoir writing has been such an awesome experience for me these past two years. 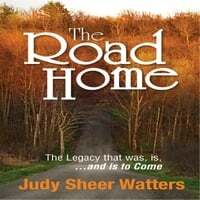 Judy Watters has the ability to encourage people like me who never would have tried my hand at writing memoirs. She is not only an experienced teacher, but she obviously loves writing memoirs of her own life and helping others write theirs. Her enthusiasm is contagious! Through her encouragement, I completed and published my own book, Amanda Grace. I highly recommend Judy Watters as a speaker of memoir writing. Judy Watters exudes her personality and fun into her book as well as her teaching of memoir. She enabled the most unlikely (me) to write my memoirs. Judy will entertain your group as she stresses the importance of life lessons and writing your story for the generations to come. Through hysterical stories of her early childhood and life with a city-slicker-wanna-be-farmer dad, Judy will trigger your own memories to start your written legacy for your generations to come.